Tomorrow we will unpack a bit more about this passage and Christ’s many mentions of marriage. Today an interesting discussion from Martin Luther, regarding the tenth commandment against covetousness and how it relates to divorce. For Luther the tenth commandment is something of a catch-all—the commandment that even the most righteous-seeming people cannot pretend not to have broken. The reformer goes on to describe the effects of covetousness on the culture and legal system, which applies greatly to us today. [Divorce] was not considered a sin nor disgrace with them; as little as now with hired help, when a proprietor dismisses his man-servant or maid-servant, or takes another’s servants from him in any way. Therefore, they thus interpreted these commandments: that no one think or purpose to obtain what belongs to another (such as his wife, servants, house and estate, land meadows, cattle) even with a show of right or by a subterfuge, yet with injury to his neighbor. For above, in the Seventh Commandment, the vice is forbidden where one wrests to himself the possessions of others, or withholds them from his neighbor, which he cannot do by right. But here it is also forbidden to alienate anything from your neighbor, even though you could do so with honor in the eyes of the world, so that no one could accuse or blame you as though you had obtained it wrongfully. By nature no one desires to see another have as much as himself. Each one acquires as much as he can; the other may fare as best he can. 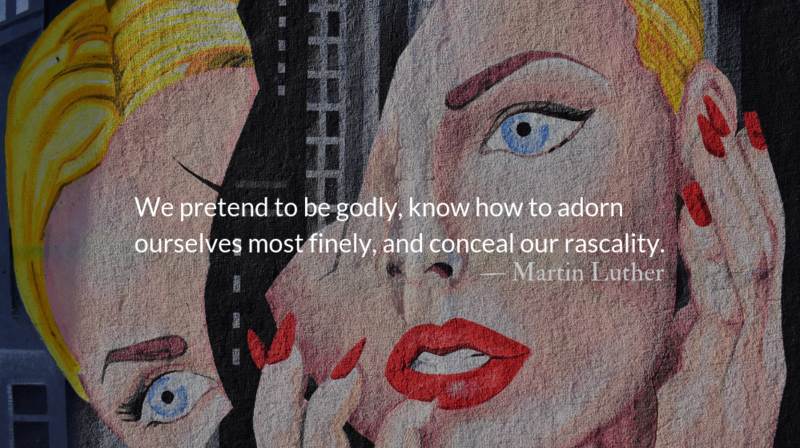 And yet we pretend to be godly, know how to adorn ourselves most finely, and conceal our rascality. We resort to and invent adroit devices and deceitful artifices (such as now are daily most ingeniously contrived) as though they were derived from the law codes. Yes, we even dare impertinently to refer to it, and boast of it, and will not have it called rascality, but shrewdness and caution. In this lawyers and jurists assist, who twist and stretch the law to suit it to their cause. We stress words and use them for a subterfuge, irrespective of equity or a neighbor’s necessity. This last commandment therefore is given not for rogues in the eyes of the world, but just for the most pious. It is for those who wish to be praised and be called honest and upright people, since they have not offended against the former commandments, as especially the Jews claimed to be, and even now many great noblemen, gentlemen, and princes. *From Martin Luther’s Catechism on the Ten Commandments. Edited for length and language updated. May we examine our hearts to uncover the places we twist God’s words, defining them in ways that make us appear righteous in our own actions, rather than as we are: wretched, covetous sinners redeemed by the mercy of Christ. All Christians are commitment-phobic about Christ’s teachings in the Sermon on the Mount.